The top three in yet another Coventry final that went down to the wire. Winner Mark Woodhull (335), second placed Stuart Smith Junior (390) and third, Craig Finnikin (55). 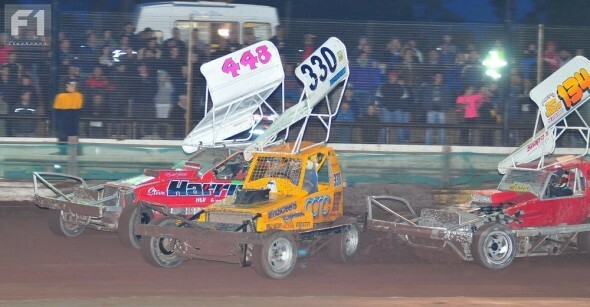 Jason Eaton (448) dives inside fellow white top John Brown (134) on the super-smooth Coventry shale. 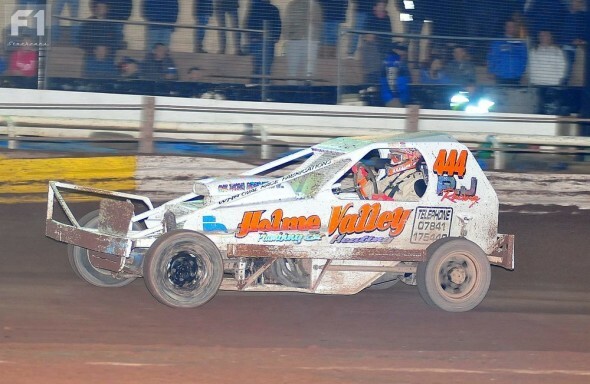 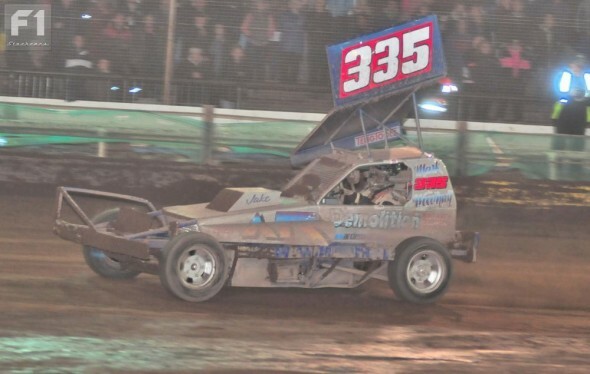 Graham Wagstaff (330), seen here in Heat One, withstood a last lap attack from none other than Frankie Wainman Junior (515) to claim victory in the 35 car Grand National. Our Nige (45) gives photographer Steve Botham a fright as he squeezes up the inside of former Rebel racer, now UK Modified pilot Steve Shaw (367) in the borrowed Steve Reedman machine. 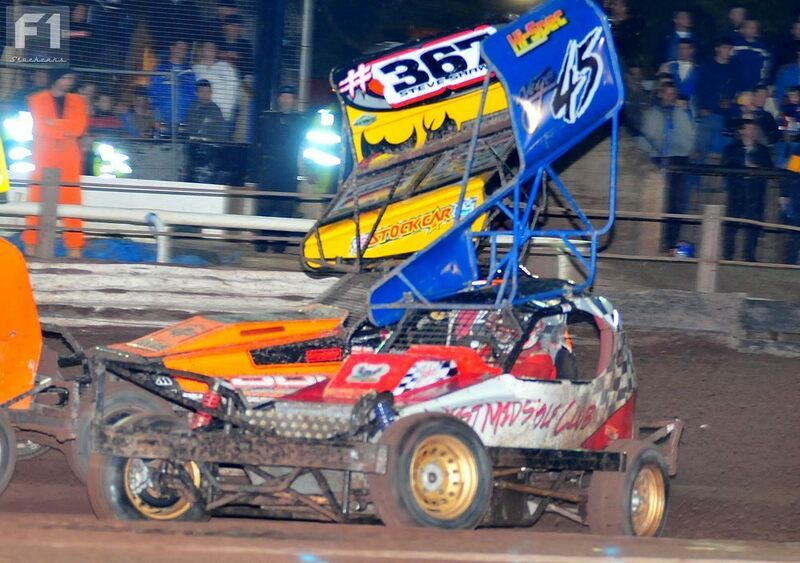 Paul Hines (259) tries to interest King John (53) in double-glazed cow sheds as they slip slide through the slurry. 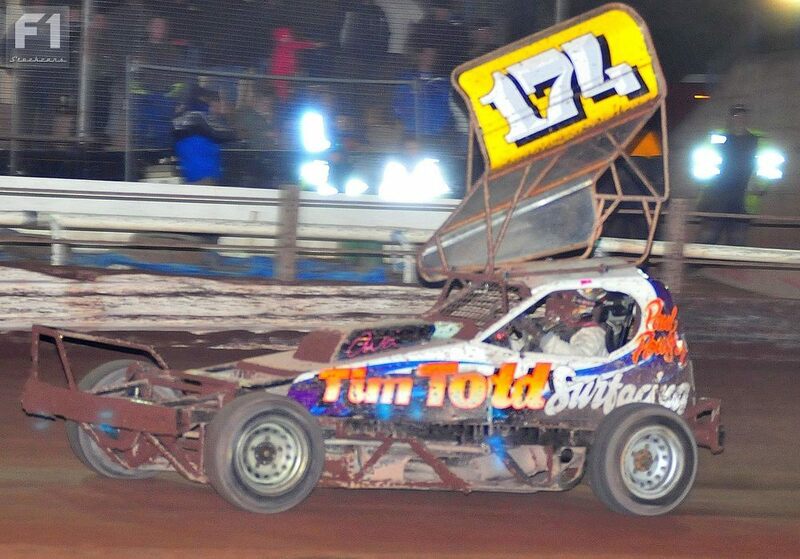 Surrey driver Paul Poulter (174) scored an impressive win in the 22 car third heat, leaving Mick Sworder (150) in his wake. Yellow tops Tony Smith (91) and Ricki Finney (435) do their best to shut the door on Ben Hurdman (207). 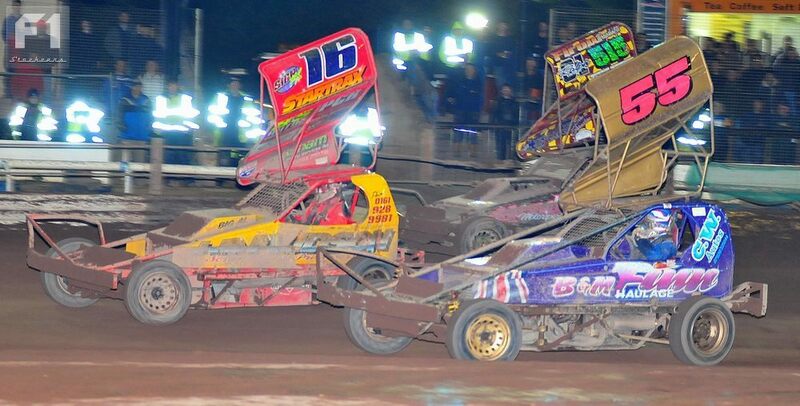 Sparks fly as Ian Noden (306) clashes with Finney (435) on the back straight, under pressure from Smith (91) and Tim Warwick (307). In a night of lower grade wins, Paul-Jay Lemons (444) drove a blinder in Heat One to take the flag, only to fall foul of post race inspection, handing the victory to Danny Wainman (212). 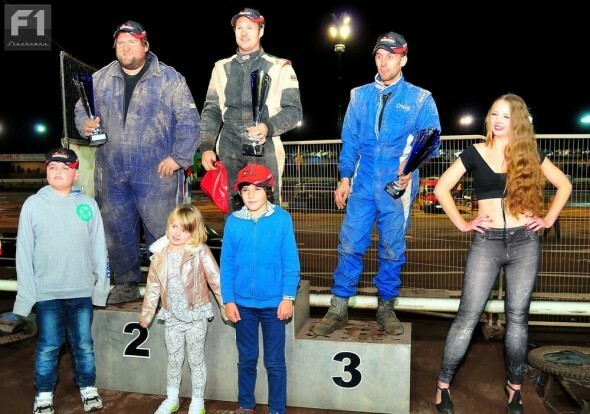 Danny sportingly insisted Paul-Jay keep the trophy. 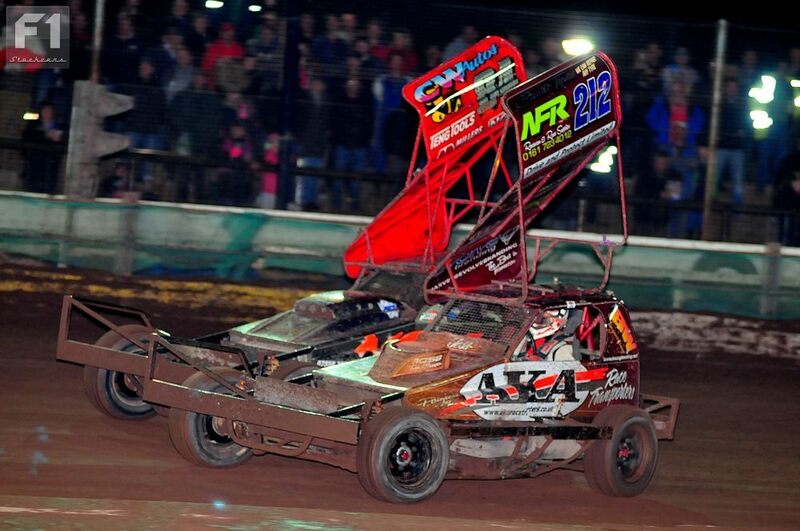 Here we see the “lightened” car, minus the aerofoil, on its way to an excellent second place finish in the consolation. 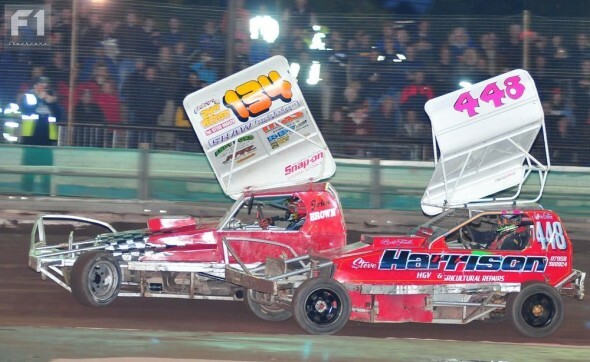 Two young guns battle it out in Heat One – Silsden superstar Danny Wainman and former Gold Top Tom Harris (84). 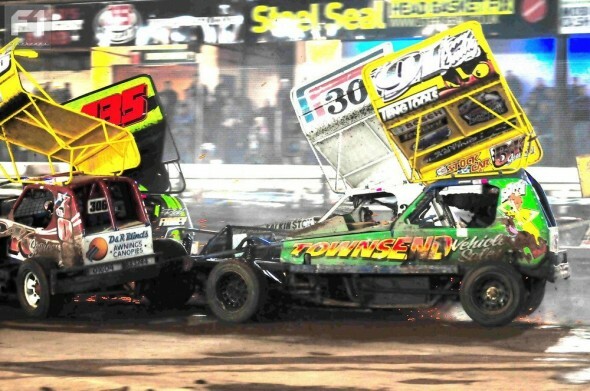 The Hook of Holland? Dutch visitor Henk Jan Ronitz (240) hooks up with Billy Johnson (169) in the meeting final. 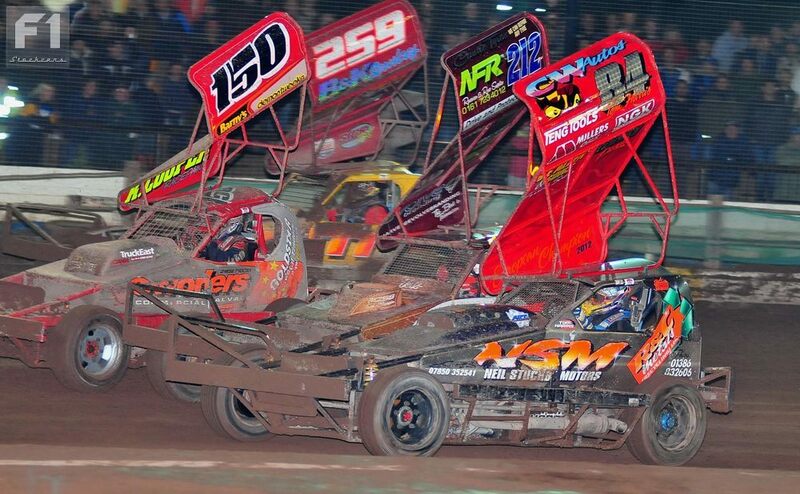 Not a lot of room for error here as Harris, Sworder, Wainman and Hines go flat out. Hmmm…It looks like Danny Wainman was the instigator of this little trip into the fence for Sworder and Harrison (197) but video evidence suggests he was just in the neighbourhood. 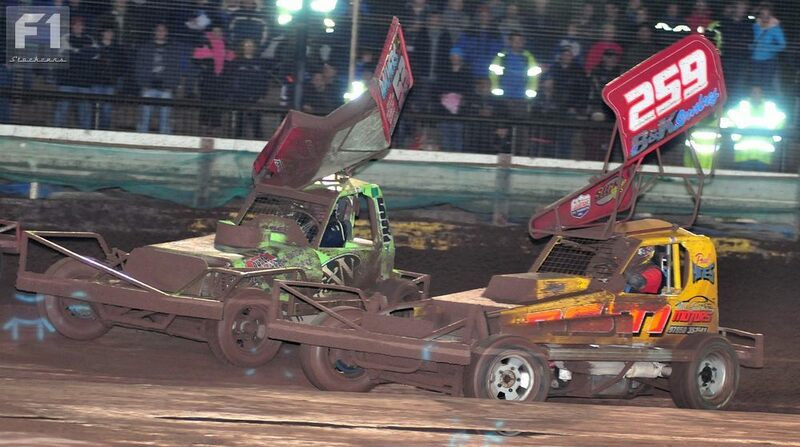 It didn’t end there! Matt Newson (16) holds a slender advantage over new World Champion Craig Finnikin (55) in the Final. 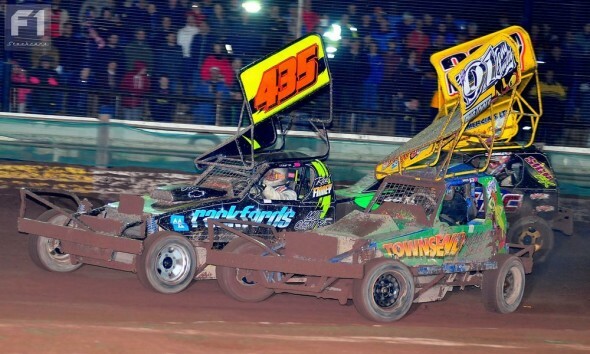 Finnikin would eventually finish third, Frankie Wainman Junior (515) fifth and Newson sixth in another hotly contested Coventry feature race. Mark Woodhull (335) survived a last bend attack from Finnikin, a trip to the armco and a side swipe from Stuart Smith Junior on his way to victory in the meeting final.